CHATTANOOGA, Tenn. (BP)—A public school system has agreed to update employees on applicable constitutional law after a special interest group complained of a Southern Baptist pastor’s impromptu prayer over an injured player at a high school football game. 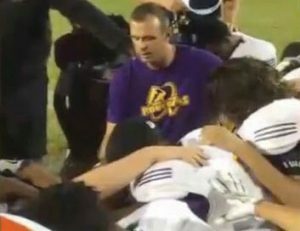 The Freedom From Religion Foundation complained that students’ rights were violated when Eric Dill, student pastor of Bayside Baptist Church in Harrison, Tenn., prayed over an injured student at a September 2016 high school football game in Chattanooga, Tenn. The student has since made a full recovery. The Hamilton County Department of Education (HCDE) will “provide additional training to its employees on the application of the Establishment and Free Exercise Clauses in public schools,” HCDE attorney D. Scott Bennett told the Freedom From Religion Foundation (FFRF) Jan. 30. The FFRF complained Jan. 27 that students’ constitutional rights were violated at a Sept. 9, 2016 football game because of a prayer by Eric Dill, student pastor of Bayside Baptist Church in Harrison, Tenn. While the school system will initiate additional training, Bennett said no laws were broken when Dill prayed over a Central High School football player who appeared temporarily paralyzed after a tackle during the game against East Ridge High School. “During these tense minutes, a local youth pastor was asked to pray for the young man,” Bennett said in a Jan. 30 letter to the FFRF. “During the prayers, a number of students circled around the pastor. Out of respect for the injured player and the young men who were praying, many coaches and officials also bowed their heads. No coaches led any prayer. “Rather than being an unconstitutional endorsement of religion,” Bennett wrote, “this was human compassion at its finest.” The injured student has since made a full recovery. Dill, a 1999 Central High School graduate and former quarterback, said the injured player himself and members of both teams requested prayer. Dill described the injured player as motionless for nearly 30 minutes after a tackle, crying uncontrollably and unable to move his legs. The coaching staff bowed their heads during the prayer out of respect for the injured student, Dill said, not as an encouragement to other students to pray. A game attendee complained anonymously to the FFRF, which in turn filed the complaint from its Madison, Wis., office. The FFRF contended that coaches or other school employees led the prayer. Dill said he doesn’t fault the complainant, but would only like the person to know the grace and truth of Jesus stated in John 1:14. Since the complaint was voiced anonymously, Dill is not able to personally share God’s Word with the complainant. The HCDE oversees about 80 schools serving 42,000 students in kindergarten through 12th grade, according to the HCDE website.